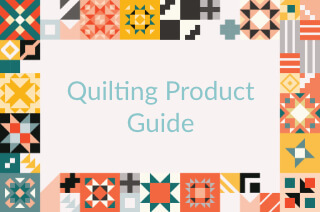 Looking back, I think I could have figured out what kind of quilt she would like, but I didn’t want to risk it. So one evening we sat down and I showed her some Pinterest boards with some modern designs I thought she might like. 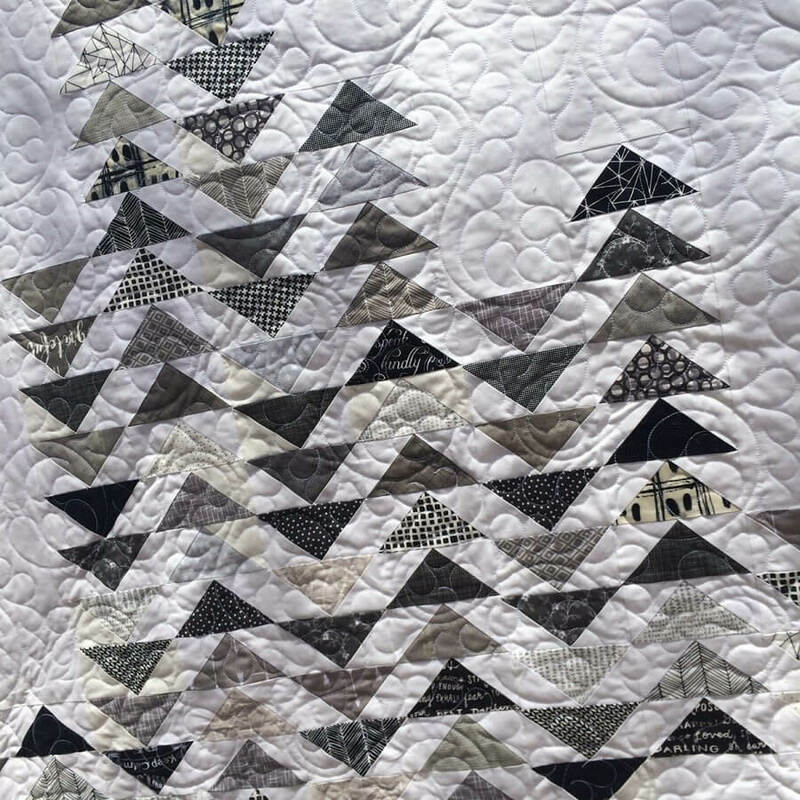 It didn’t’ take long before I realized that every quilt she liked was designed by Zen Chic, so we headed over to Brigitte’s website and found a pattern. The pattern she picked was the “SKY” pattern. Except my girl wanted it all in grays. Which I thought was cool because anyone who watches a flock of geese flying in the sky knows that they look more like gray triangles and less like a rainbow. 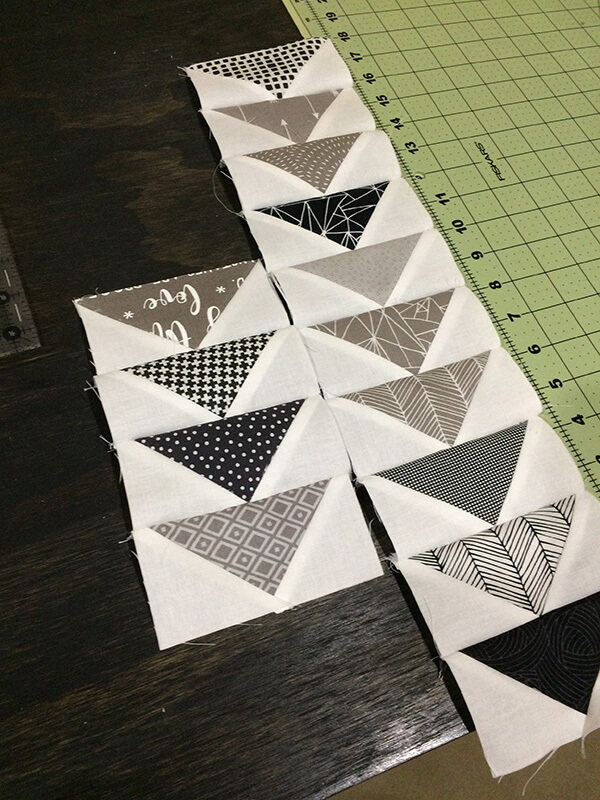 I pulled as many grays as I could find in my stash and then made a quick trip to my local quilt store and purchased a sizable number of gray fat quarters. Then I got busy making geese. Here are a few shots of the progress along the way. Then, of course, they all have to be trimmed and tidied up. I especially had fun fussy cutting the text prints. Next, all those geese had to be put in rows. 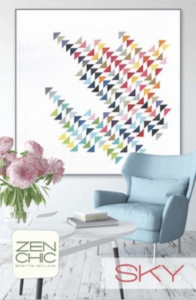 I will say that Zen Chic patterns are wonderful. The directions are clear and it had a very helpful diagram to use when it came time to lay them all out in the design. 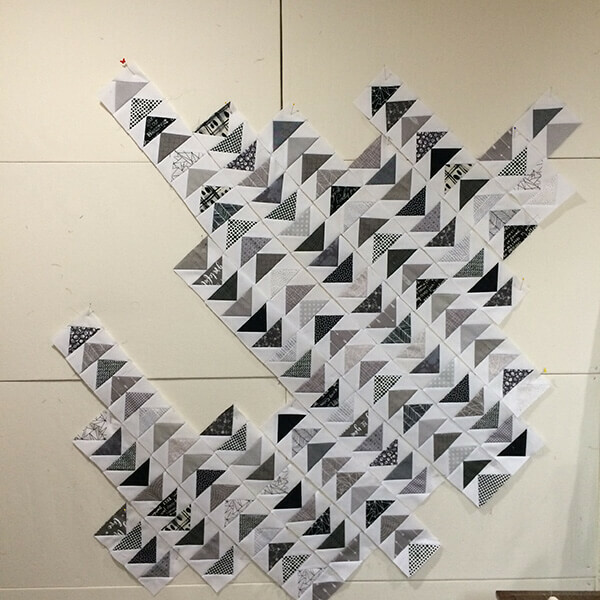 Once all the rows were together, I realized that the quilt wasn’t very large, so I added borders. 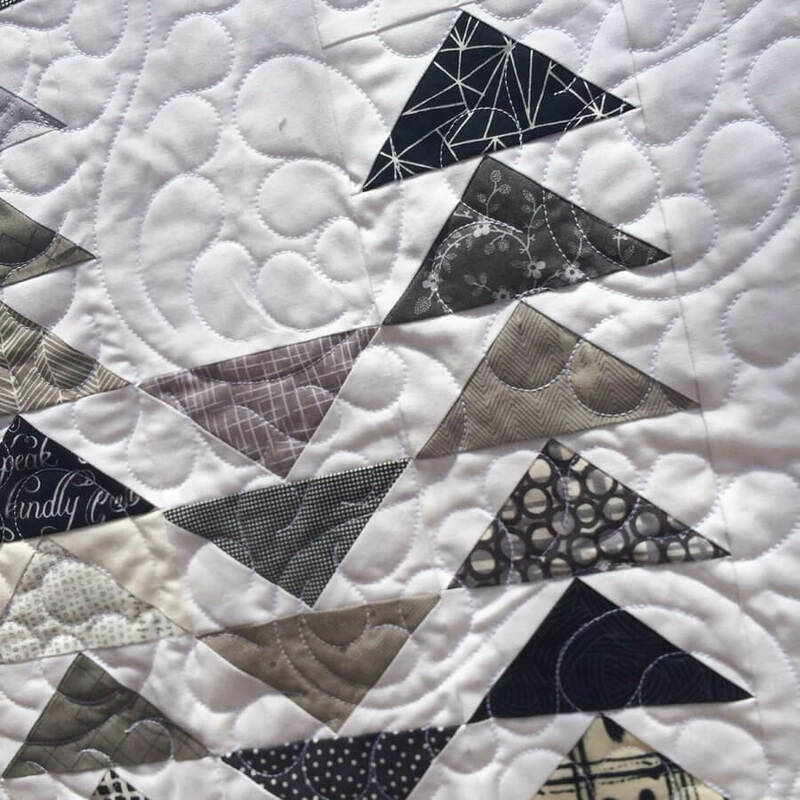 Let me say, that this was the trickiest part to making the quilt. 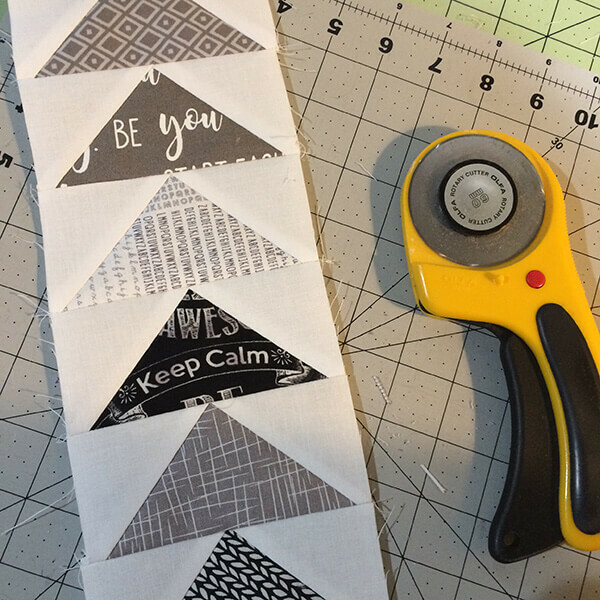 And here is why: every edge where I sewed the border was a bias edge, and it was stretchy. 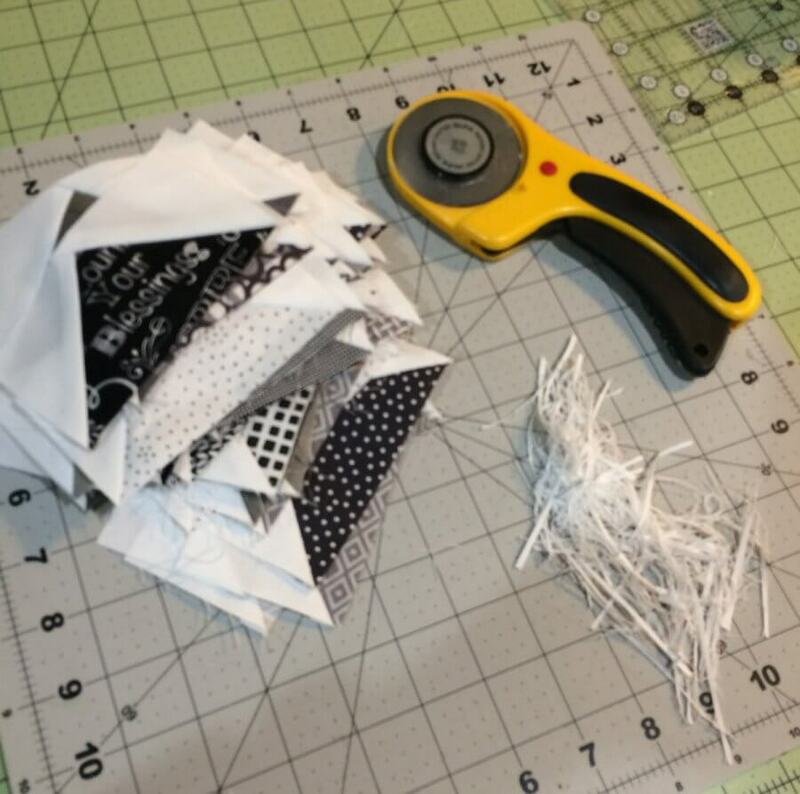 I must have measured that thing 4 times before cutting the borders. But in the end, they went on fine. 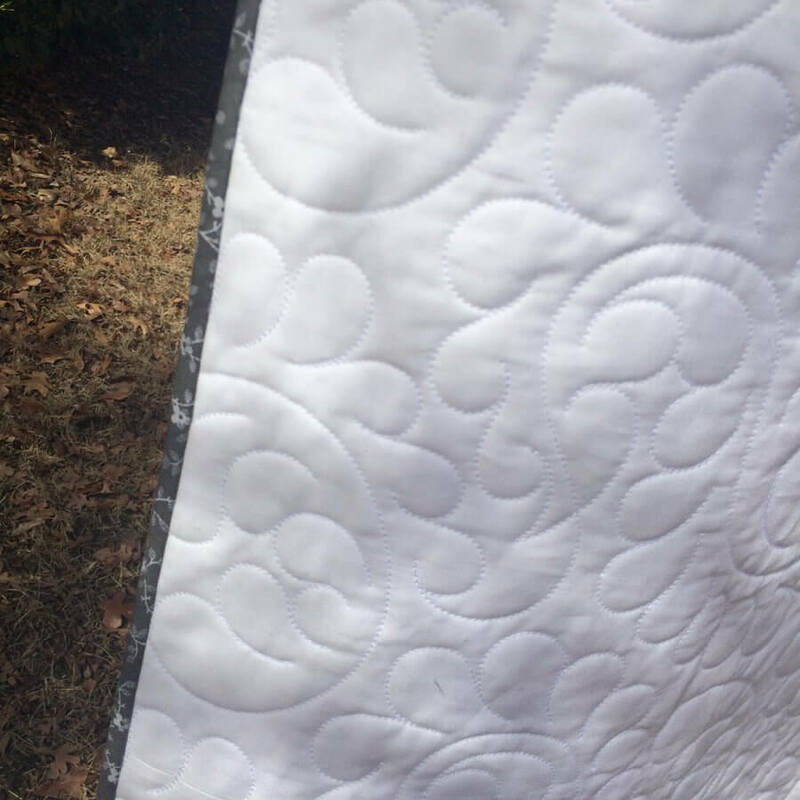 Now, she’s ready to be quilted, but once I get her back, I will post an update here with the finished product. 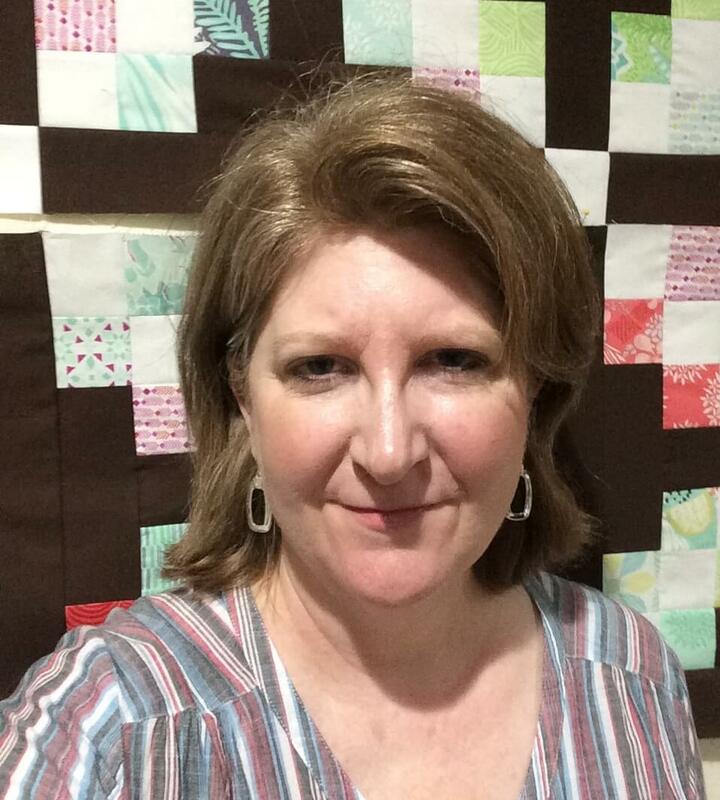 Update: Here are some shots of the finished quilt. 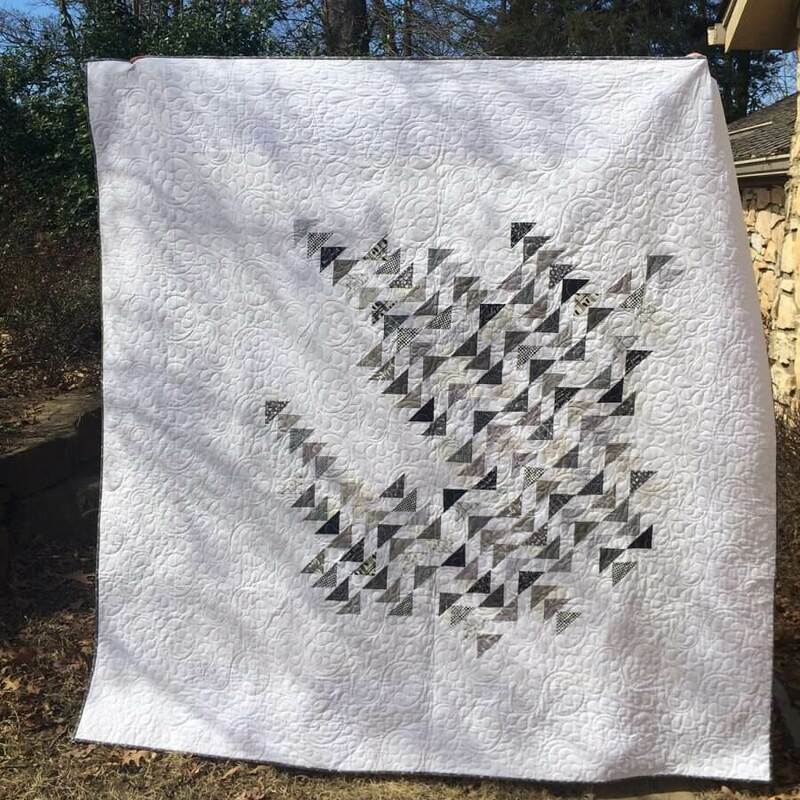 I chose to have it quilted with a feather design, which I thought was appropriate for a flock of geese! 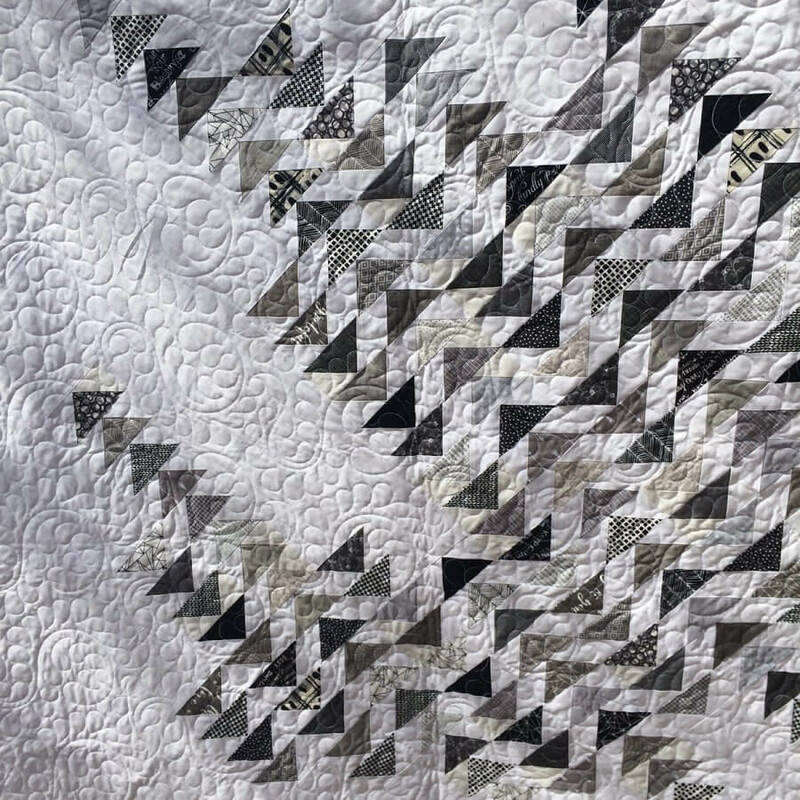 I thought the circles in the feather quilting were a nice contrast to the points in the geese, and helped give the quilt a nice rhythm. 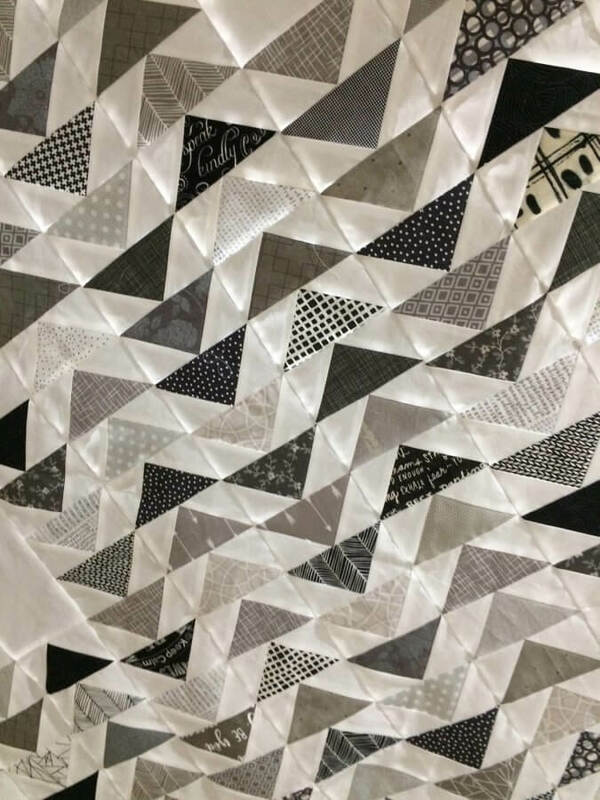 The binding is a tiny gray floral, which frames the quilt really well. 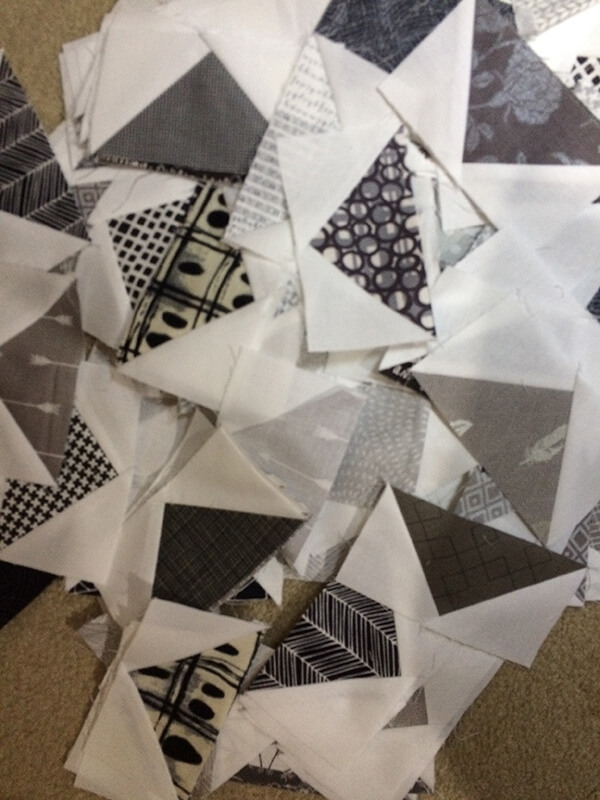 Not shown is the backing, which is the same floral pattern in a lighter gray. 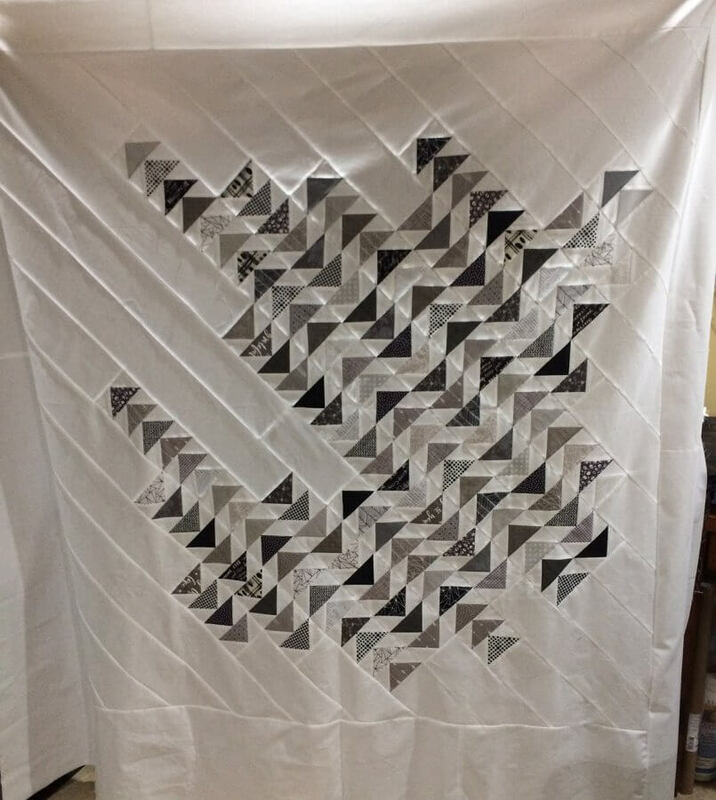 This quilt was very quick and easy to make. 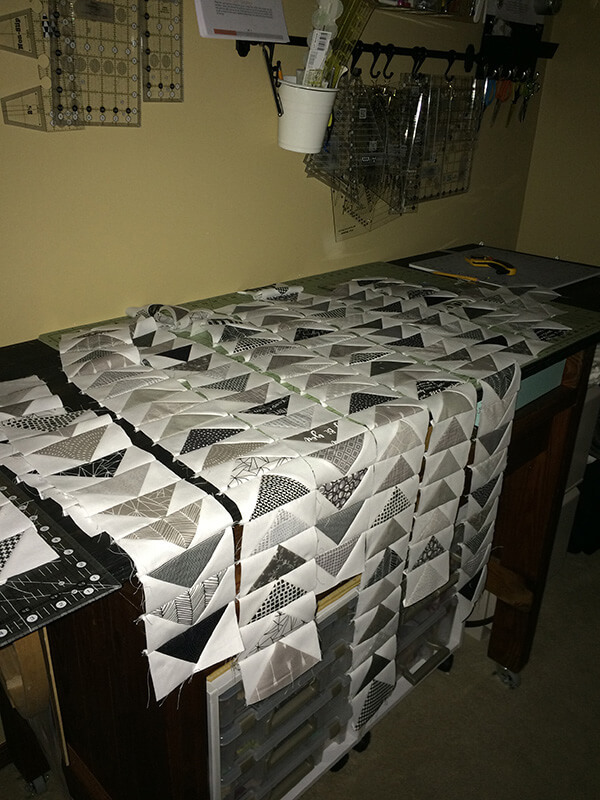 On a side note, it generated a bunch of leftover quick corners, which I quickly turned into half-square triangles. I’ve been on a mission to use these up! View this post to see what I made from these leftovers!